This page provides a summary of the history. A chronology is available on a separate page and some aspects of the history such as the legend and the local villages have been extracted to other pages. The bibliography is also on a separate page. We have recently added a list of names linked with the mines. Some of these are in the censuses for the 19th century and some in records linked to the mines. Unfortunately, very little is left of the mine records and part is currently inaccessible to general researchers. More detailed history will be added in due course. Copper and lead mining is known from written records to have taken place at Alderley Edge since the 1690s. Since the mid-1990s, the quality of the evidence for earlier mining has been improved considerably with three particular findings. In the nineteenth century, crudely shaped stones were found in the bottom of old workings and were thought to be Bronze Age hammer stones. At the same time, a wooden shovel was found and recorded by J D Sainter in 1878. Charles Roeder, in a paper published in 1901, describes his finds and conclusions and cites also the discoveries by Professor Boyd-Dawkins in 1870. A later article written by Roeder and Graves (1905) added to the theory of Bronze Age working that there was a possibility of Roman mining. The picture was transformed when in 1993 the wooden shovel was rediscovered by Alan Garner and carbon dated to around 1750 BC. This finding changed Bronze Age working from possible, to probable, to near certainty. Subsequently, the Alderley Edge Landscape Project was set up and excavation around Engine Vein revealed what are believed to be Bronze Age hearths. Roman mining was however considered unlikely until the finding in 1995 of a 4th century Roman coin hoard in an abandoned shaft at Engine Vein. This dated the shaft to the 4th century or earlier and its regularity and depth suggested that the Romans may well have worked it. An archaeological excavation was undertaken by DCC members supervised by the Alderley Edge Landscape Project archaeologists and at the bottom, timbers were revealed which were carbon dated to the last century BC. Given that they were heartwood from cut timbers, the dating cannot be precise and the shaft is now believed to be Roman in origin. The passage from the shaft to the Vein was driven from the direction of the shaft and resembles other Roman workings in the UK, such as at Dolaucothi. Between the Roman working and 1690, there is scant evidence of mining except a reference to "myne holes" which cannot be relied on as evidence of mining in progress. 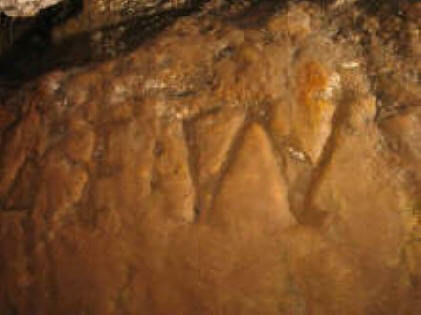 There is an article about the mines at a Bronze Age site on the WWW. Click HERE to visit it. 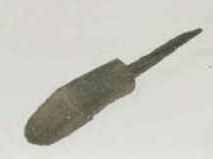 Bronze Age shovel. Wooden shovel found in the 19th century and dated to around 1750 BC. Bronze Age workings at Engine Vein. The rounded pits are a distinctive feature. They have been intersected by later working. 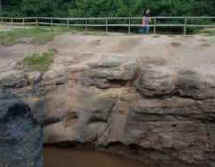 More workings like this can be seen at Pillar Mine. Roman level in Engine Vein. This level is larger and squarer than any other hand-picked levels and leads straight FROM Pot Shaft which is also Roman. 19th C workings in Wood Mine. Rarely, for Alderley Edge, this picture shows timber props installed in the 1860s or 1870s. Destroying Engine Vein. The entrance to Engine Vein being blown up. Visiting the mines in the 21st century. A picture taken at the Open Day in 2001 showing a geology display in Sand Cavern under floodlighting. From 1693 to the mid-1800s, various people are reported to have explored the Edge for copper and work was done at Saddlebole, Stormy Point, Engine Vein and Brynlow. It is likely that the near-surface sections of Wood Mine were investigated during this period. One operator of note was Charles Roe of Macclesfield who worked the mines from 1758 to 1768 before moving over to Anglesey on the discovery of major deposits of copper at Parys Mountain. Apart from Roe, the history of working up to 1857 is patchy. The best recorded period was between about 1805 and 1815 when a company of local men including a Derbyshire miner, James Ashton, tried to exploit the mines for lead. During the course of their work, they identified the presence of cobalt which was in demand during the Napoleonic blockade of supplies. Evidence in the field points to the working of a series of mines on a north-south fault running from Saddlebole to Findlow Hill Wood . Some parts of Engine Vein also appear to have been excavated at this time. The work ended when the price of cobalt fell. The leases for the period tell a sad story for Ashton who sacrificed his salary for his share in the company but even lost this when the company called for more capital than he could provide - and yet he was the man down the mine doing the work! In 1857, a Cornish man with extensive smelting experience, James Michell, started work at West Mine and moved on in the 1860s to Wood Mine and Engine Vein. His company lasted 21 years (the length of the lease) although Michell died in an accident in the mines in 1862. During this working period, nearly 200,000 tons of ore were removed yielding 3,500 tons of copper metal. The mines closed in 1877 and the Abandonment Plan of 1878 shows all the workings open at that date. This period saw the mining of West Mine and Wood Mine and the reworking of Engine Vein, Brynlow, Doc Mine and other smaller mines on the Edge. There were some small and unsuccessful attempts to re-open the mines during the First World War but these ended in a sale of equipment in 1926. 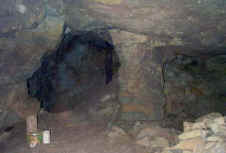 From the 1860s onwards, there have been many thousands of visitors to the mines, many - including the earliest - with good lighting and experienced leaders. However, many other visitors, especially between 1940 and 1960, were ill-equipped and unprepared. This led to a series of tragic accidents which gained the mines a notoriety which still haunts them today. The West and Wood Mines were finally blocked in the early 1960s. In 1969, the Derbyshire Caving Club obtained permission from the National Trust (the owners) to re-open Wood Mine. The mine was dug open in 1970 and a re-opening ceremony was held in October of that year. 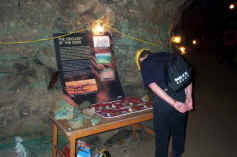 Since 1970, hundreds of visitors have been provided with miners' lamps and helmets and led in safety around Wood Mine. In 1975, the owner of West Mine was persuaded to allow the Caving Club to make a new and safe entrance to that mine. The owner proposed opening the mine to the general public after provision of lighting and paths but this idea was opposed locally and was abandoned. In 1981, the Engine Vein was capped for safety purposes and added to the Caving Club's lease. Visitors can now be taken safely around Engine Vein, Wood Mine or West Mine and many parties visit each year. In the late 1980s, an Open Day was inaugurated by the Club and for two weekends each year, the public can visit Wood Mine or Engine Vein without making prior arrangements. During the late 1980s and early 1990s, the main emphasis had been on reopening the full length of the Hough Level, the tunnel that underlies all of the mines. By the start of 1992, the route from Wood Mine to the Edge below Stormy Point was open for the full length, although parts still require visitors to wear specialist caving equipment. As well as opening the mines for visitors, the Club's members enjoy excavating blocked shafts and passages to find as much as possible of the abandoned workings. This activity is covered in another page on exploration at Alderley Edge and on the page regarding archaeology as work now involves a blend of brute force and science if we are to get as much benefit as possible out of the investigation.